VMware vRealize Log Insight 3.3.2 for NSX provides intelligent log analytics for NSX, with monitoring and troubleshooting capabilities and customizable dashboards for network virtualization, flow analysis and alerts. This version accepts NSX Standard/Advanced/Enterprise edition license keys issued for NSX. This means that all users with a NSX 6.2.3 licence (and beyond) are now entitled to vRealize Log Insight for NSX at no additional charge. Although similar to Log Insight for vCenter, there are some minor differences which are described in the vRealize Log Insight for NSX FAQ. Log Insight 3.3.2 (or later) and NSX 6.2.3 (or later). vRealize Log Insight for NSX is a full functioning version of Log Insight but is EULA limited to vSphere and NSX log data and content packs only. The license model of Log Insight for NSX mirrors the license model of the NSX with which it is purchased. NSX and Log Insight are both awesome products, so I encourage you to check the vRealize Log Insight for NSX FAQ. NSX for vSphere 6.2.3 Releases Notes. 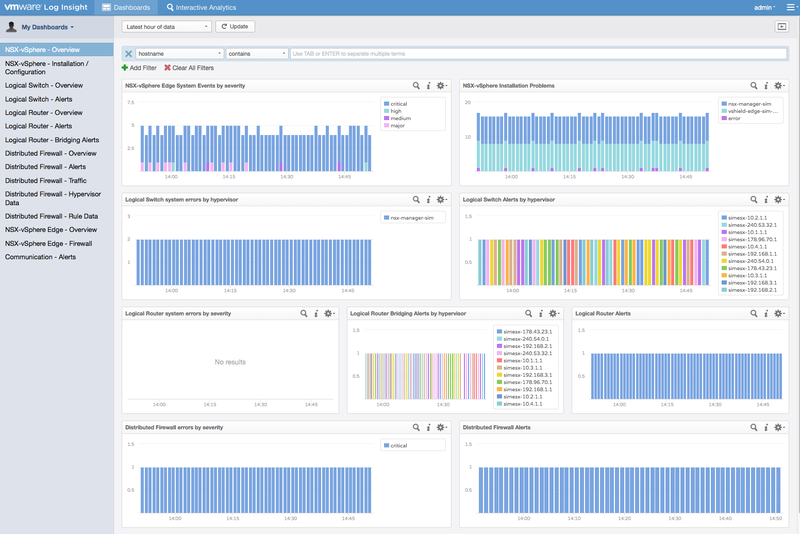 vRealize Log Insight 3.3.2 Release Notes. vRealize Log Insight for NSX FAQ.